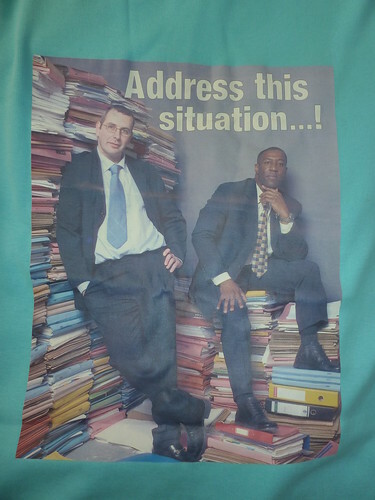 This image is taken from an advert which was in the Records Management Society’s magazine. I thought it was hilarious, and stuck it up on our office wall to ‘prove’ to everyone that records management was cool. My colleague got it put onto a t-shirt for me, which is why you can’t see what company it was in this photo. Anyway, I still find it hysterically funny. But isn’t “ADDRESS THIS SITUATION!” perfect advice for life in general? Looking at it again, it almost looks like one of those LOLcat pictures but about records management… I CAN HAZ NO RETENSHUIN SKEDOOL!